Krecl, P., Targino, A.C., Ketzel, M., Cipoli, Y.A., Charres, I. Potential to reduce the concentrations of short-lived climate pollutants in traffic environments: A case study in a medium-sized city in Brazil. Transportation Research Part D, doi: 10.1016/j.trd.2019.01.032, 2019. Gidhagen, L., Krecl, P., Targino, A.C., Polezer, G., Godoi, R.H.M., Castelhano, F., Felix, E., Cipoli, Y.A., Malucelli, F., Wolf, A., Alonso, M., Segersson, D., Amorim, J.H., Mendonça, F.
Experimental and model assessment of PM2.5 and BC emissions and concentrations in a Brazilian city – the Curitiba case study. Atmos. Chem. Phys. Discuss., doi: 10.5194/acp-2018-1094, 2018. Targino, A.C., Krecl, P., Danziger Filho, J.E., Segura, J.F., Gibson, M.D. Spatial variability of on-bicycle black carbon concentrations in the megacity of São Paulo: A pilot study. Environmental Pollution, doi: 10.1016/j.envpol.2018.07.003, 2018. Targino, A.C., Coraiola, G.C., Krecl, P.
Green or blue spaces? Assessment of the effectiveness and costs to mitigate the urban heat island in a Latin American city. Theoretical and Applied Climatology, doi: 10.1007/s00704-018-2534-1, 2018. Krecl, P., Targino, A.C., Landi, T.P., Ketzel, M.
Determination of black carbon, PM2.5, particle number and NOx emission factors from roadside measurements and their implications for emission inventory development. Atmospheric Environment, 186, 229-240, 2018. Carvalho, A.M., Krecl, P., Targino, A.C.
Variations in individuals’ exposure to black carbon particles during their daily activities: a screening study in Brazil. Environmental Science and Pollution Research, doi: 10.1007/s11356-018-2045-8, 2018. Pattinson, W., Targino, A.C., Gibson, M.D., Krecl, P., Cipoli, Y., Sá, V.
Quantifying variation in occupational air pollution exposure within a small metropolitan region of Brazil. Atmospheric Environment, 182, 138-154, 2018. Patrick, E., Segura, J.F., Targino, A.C., Gibson, M.
Exposure to short-lived air pollutants on public transit in Brazil. International Society of Exposure Science. Research Triangle Park, EUA, 2017. Targino, A.C., Rodrigues, M.V.C, Krecl, P., Cipoli, Y.A., Ribeiro, J.P.M. Commuter exposure to black carbon particles on diesel buses, on bicycles and on foot: a case study in a Brazilian city. Environmental Science and Pollution Research, 25, 1132–1146, 2018. Krecl, P., Targino, A.C., Wolf, A., Segersson, D., Felix, E. et al. Emission and ambient concentrations of black carbon particles in Curitiba, Brazil. Congreso Colombiano y Conferencia Internacional de Calidad del Aire y Salud Pública. Cali, Colômbia, 2017. Targino, A.C., Krecl, P., Cipoli, Y.A., Toloto, M.O., Gidhagen, L.
Measuring the spatial variability of PM2.5 and black carbon concentrations in a Brazilian city using bicycles. Congreso Colombiano y Conferencia Internacional de Calidad del Aire y Salud Pública. Cali, Colômbia, 2017. Krecl, P., Johansson, C., Targino, A.C., Ström, J., Burman, L.
Trends in black carbon and size-resolved particle number concentrations and vehicle emission factors under real-world conditions. Atmospheric Environment, 165, 155-168, 2017. Targino, A.C., Machado, B.L.F., Krecl, P.
Concentrations and personal exposure to black carbon particles at airports and on commercial flights. Transportation Research Part D: Transport and Environment, 52, 128–138, 2017. 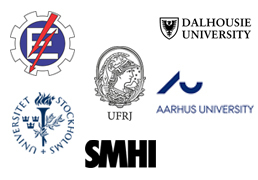 Krecl, P., Johansson, C., Ström, J., Targino, A.C.
Black carbon, total and size-resolved particle number emission factors by fuel type in real-world conditions. 17th IUAPPA World Clean Air Congress and 9th CAA Better Air Quality Conference, Busan, Coreia do Sul, 2016. Targino, A.C., Machado, B.L.F, Krecl, P.
Black carbon concentrations at airports and in passenger aircraft. Are our travels clean? 17th IUAPPA World Clean Air Congress and 9th CAA Better Air Quality Conference, Busan, Coreia do Sul, 2016. Targino, A.C., Gibson, M.D., Krecl, P., Rodrigues, M.V.C., Santos, M.M., Corrêa, M.P. Hotspots of black carbon and PM2.5 in an urban area and relationships to traffic characteristics. Environmental Pollution, 218, 475-486, 2016. Krecl, P., Targino, A.C., Wiese, L., Ketzel, M., Correa, M.P. Screening of short-lived climate pollutants in a street canyon in a mid-sized city in Brazil. Atmospheric Pollution Research, 7, 1022-1036, 2016. Local and Regional Contributions to Black Carbon Aerosols in a Mid-Sized City in Southern Brazil. Aerosol and Air Quality Research, 16, 125-137, 2016. Ornellas, R.M., Mohammed, K., Targino, A.C., Galvão, P.M.A., Torres, J.P.M., Malm, O., Lohmann, R.
Use of passive samplers to detect organochlorine pesticides in air and water at wetland mountain region sites (S-SE Brazil). Chemosphere, 144, 2175-2182, 2016. Meire, R.O., Khairy, M., Targino, A.C. et al. Legacy and recently banned OCPS over shallow freshwaters in tropical and subtropical mountain regions in Brazil. 35th International Symposium on Halogenated Persistent Organic Pollutants (Dioxin), São Paulo, Brasil, 2015. Screening of short-lived climate pollutants in a street canyon in southern Brazil. European Aerosol Conference, Milão, Itália, 2015. Krecl, P., Targino. A.C., Ribeiro, J.P.M. Passenger exposure to black carbon particles from ferryboat emissions. European Aerosol Conference, Milão, Itália, 2015. Rodrigues, M.V., Santos, M.M., Krecl, P., Gibson, M. et al. Mapping the spatial variability of black carbon and fine particle concentrations in Londrina, Brazil, using bicycles as mobile sampling platforms. European Aerosol Conference, Milão, Itália, 2015. Assessment of workers’ personal exposure to atmospheric black carbon in different urban environments in southern Brazil. European Aerosol Conference, Milão, Itália, 2015. Targino, A.C., Ribeiro, J.P.M., Krecl, P.
Black carbon particle concentrations on public bus routes. European Aerosol Conference, Milão, Itália, 2015. Krecl, P., Bennet, C., Alonso, M., et al. Impact of black carbon and fine particles on air quality in a small city in South Brazil. European Aerosol Conference, Milão, Itália, 2015. Krecl, P., Targino, A. C., Johansson, C., Ström, J.
Characterisation and Source Apportionment of Submicron Particle Number Size Distributions in a Busy Street Canyon. Aerosol and Air Quality Research, 15, 220-233, 2015. Krecl, P., Johansson, C., Ström, J., Lovenheim, B., Gallet, J. A feasibility study of mapping light absorbing carbon using a taxi fleet as a mobile platform. Tellus B, 66, 1-17, 2014. Krecl, P., Johansson, C., Ström, J., Gallet, J., Lovenheim, B. A feasilbility study of mapping light absorbing carbon using a taxi fleet as a mobile platform. 9th International Conference on Air Quality: Science and Application, Garmisch-Partenkirchen, Alemanha, 2014. Targino, A. C., Krecl, P., Johansson, C.
Simulated airway particle deposition in an urban environment impacted by biomass smoke. 9th International Conference on Air Quality: Science and Application, Garmisch-Partenkirchen, Alemanha, 2014. Measurements of particulate matter in an urban environment using a mobile platform. 13th Science Conference of the International Global Atmospheric Chemistry Project, Natal, Brasil, 2014. Mobile measurements of light-absorbing carbon using a taxi fleet. 13th Science Conference of the International Global Atmospheric Chemistry Project, Natal, Brasil, 2014. Targino, A. C., Godoi, R. H. M., Krecl, P., Wiese, L. F.
Air quality implications of backyard burning in urban areas. 13th Science Conference of the International Global Atmospheric Chemistry Project, Natal, Brasil, 2014. Mapping out light-absorbing carbon with a taxi fleet. NOSA Aerosol Symposium, Estocolmo. Suécia, 2014. Gamarra, N. L. R., Corrêa, M. P., Targino, A. C.
Utilização de sensoriamento remoto em análises de albedo e temperatura de superfície em Londrina – PR: contribuições para estudos de ilha de calor urbana. Revista Brasileira de Meteorologia, 29, 537-550, 2014. Targino, A. C., Krecl, P., Coraiola, G. C.
Effects of the atmospheric circulation on the onset and strength of urban heat islands: a case study. Theoretical and Applied Climatology, 117, 73–87, 2014. Targino, A. C., Krecl, P., Martins, C., Coraiola, G.C. Intensidade da ilha de calor urbana: Quando a cobertura do solo é importante? Simpósio Internacional de Climatologia, Florianópolis, 2013. Martins, C., Krecl, P., Targino, A. C.
Características da ilha urbana de calor em Londrina (PR) no verão. Simpósio Internacional de Climatologia, Florianópolis, 2013. Targino, A. C., Krecl, P., Johansson, C., Swietlicki, E., Massling, A., Coraiola, G. C., Lihavainen, H.
Deterioration of air quality across Sweden due to transboundary agricultural burning emissions. Boreal Environment Research, 18, 19-36, 2013. Meire, R. O., Targino, A. C., Torres, J.P.M. Bulk atmospheric deposition of persistent toxic substances (PTS) along environmental gradients in Brazil. Environmental Science and Pollution Research, 20, 2046-2053, 2013. Desenvolvimento espaço-temporal da Intensidade da Ilha de Calor Urbana em Londrina durante o inverno. XVII Congresso Brasileiro de Meteorologia, Gramado, Brasil, 2012. Coraiola, G. C., Targino, A. C., Krecl, P., Chernev, L. M.
Spatio-temporal distribution of the urban heat island in a tropical city during winter time. XI Congreso Argentino de Meteorología, Mendoza, Argentina, 2012. Chernev, L. M.,Targino, A. C., Coraiola, G. C., Krecl, P.
Outdoor thermal comfort indices and their relation to land use over an urban area during winter time. XI Congreso Argentino de Meteorología, Mendoza, Argentina, 2012. The role of atmospheric circulation on the onset and strength of urban heat islands. XI Congreso Argentino de Meteorología, Mendoza, Argentina, 2012. Meire, R. O., Lee, S. C., Targino, A. C., Torres, J.P.M., Harner, T.
Air concentrations and transport of persistent organic pollutants (POPs) in mountains of southeast and southern Brazil. Atmospheric Pollution Research, 3, 417-425, 2012. Meire, R. O., Lee, S. C., Yao, Y., Targino, A. C., Torres, J.P.M., Harner, T.
Seasonal and altitudinal variations of legacy and current-use pesticides in the Brazilian tropical and subtropical mountains. Atmospheric Environment, 59, 108-116, 2012. Melo, T. B., Targino, A. C., Vedovate, B. M.
Mapeamento do consumo de energia elétrica e sua relação com variáveis meteorológicas e socioeconômicas. XVII Congresso Brasileiro de Meteorologia, Gramado, Brasil, 2012. Allen, G., Coe, H., Clarke, A., Bretherton, C., Wood, R., Abel, S. J., Barrett, P., Brown, P., George, R., Freitag, S., McNaughton, C., Howell, S., Shank, L., Kapustin, V., Brekhovskikh, V., Kleinman, L., Lee, Y.-N., Springston, S., Toniazzo, T., Krejci, R., Fochesatto, J., Shaw, G., KRECL, P., et al. South East Pacific atmospheric composition and variability sampled along 20 S during VOCALS-REx. Atmospheric Chemistry and Physics, 11, 5237-5262, 2011. Krecl, P., Targino, A. C., Johansson, C.
Spatio-temporal distribution of light-absorbing carbon in Stockholm. 2nd Conference of the Brazilian Association for Aerosol Research, Rio de Janeiro, Brasil, 2011. Spatiotemporal distribution of light-absorbing carbon and its relationship to other atmospheric pollutants in Stockholm. Atmospheric Chemistry and Physics, 11, 11553-11567, 2011. Targino, A. C., Coe, H., Chourlaton, T. W., Baltensperger, U., Cozic, J.
Observations of particle chemical composition and influence on the phase of cold clouds. 11th International Global Atmospheric Chemistry Conference (IGAC), Halifax, Canadá, 2010. Krecl, P., Johansson, C., Ström, J.
Spatiotemporal variability of light-absorbing carbon concentration in a residential area impacted by woodsmoke. Journal of the Air & Waste Management Association, 60, 356-368, 2010. Spatio-temporal variability of light-absorbing carbon concentration in a residential area impacted by woodsmoke. 11th Science Conference of the International Global Atmospheric Chemistry Project, Halifax, Canadá, 2010. Liu, D., Flynn, M.,Gysel, M., Targino, A. C., Crawford, I., Bower, K. Choularton, T., Jurányi, Z.,Steinbacher, M.,Hüglin, C.,Curtius, J., Kampus, , M., Petzold, A., Weingartner, E., Baltensperger, U., Coe, H.
Single particle characterization of black carbon aerosols at a tropospheric alpine site in Switzerland. Atmospheric Chemistry and Physics, 10, 7389-7407, 2010. Targino, A. C., Coe, H., Chourlaton, T. W.
The effects of aerosol chemical composition on the phase of cold clouds: An observational study. XVI Congresso Brasileiro de Meteorologia, Belém, Brasil, 2010. Targino, A. C., Coe, H., Cozic, J., Crosier, J., Crawford, I., Bower, K., Flynn, M., Gallagher, M., Allan, J., Verheggen, B., Weingartner, E., Baltensperger, U., Choularton, T.
Influence of particle chemical composition on the phase of cold clouds at a high-alpine site in Switzerland. Journal of Geophysical Research, 114, D18206, 2009. Sheesley, R. J., Krusa, M., Krecl, P., Johansson, C., Gustaffson, O. Source apportionment of elevated wintertime PAHs in a northern Swedish town by compound specific radiocarbon analysis. Atmospheric Chemistry and Physics, 9, 3347-3356, 2009. Krecl, P., Hedberg, L. E., Ström, J., Johansson, C.
Contribution of residential wood combustion and other sources to hourly winter aerosol in Northern Sweden determined by positive matrix factorization. Atmospheric Chemistry and Physics, 8, 3639-3653, 2008. Contribution of residential wood combustion to hourly winter aerosol in Northern Sweden determined by positive matrix factorization. 9th International Conference on Carbonaceous Particles in the Atmosphere, Berkeley, EUA, 2008. Krecl, P., Ström, J., Johansson, C.
Diurnal variation of atmospheric aerosol during the wood combustion season in Northern Sweden. Atmospheric Environment, 42, 4113-4125, 2008. Drewnick, F., Schneider, J., Hings, S.S., Hock, N., Noone, K.J., Targino, A. C., Weimer, S., Borrmann, S.
Measurement of ambient, interstitial, and residual aerosol particles on a mountaintop site in central Sweden using an a erosol mass spectrometer and a CVI. Journal of Atmospheric Chemistry, 56, 1-20, 2007. Targino, A. C., Noone, K.J., Drewnick, F., Schneider, J., Krejci, R., Olivares, G., Hings, S.S., Borrmann, S.
Microphysical and chemical characteristics of cloud droplet residuals and interstitial particles in continental stratocumulus clouds. Atmospheric Research, 86, 225-240, 2007. Choularton, T. W., Bower, K. N., Weingartner, E., Crawford, I.,Coe, H., Gallagher, M. W., Flynn, M., Crosier, J., Connolly, P., Targino, A. C., Alfarra, M. R., Baltensperger, U., Sjögren, S., Verheggen, B., Cozic, J., Gysel, M.
The influence of small aerosol particles on the properties of water and ice clouds. Faraday Discussions, 137, 205-222, 2007. Carbon content of atmospheric aerosols in a residential area during the wood combustion season in Sweden. Atmospheric Environment, 41, 6974-6985, 2007. Airborne in situ characterization of dry urban aerosol optical properties around complex topography. Atmospheric Research, 79, 148-174, 2006. Targino, A. C., Krejci, R., Noone, K. J., Glantz, P.
Single particle analysis of ice crystal residuals observed in orographic wave clouds over Scandinavia during INTACC experiment. Atmospheric Chemistry and Physics, 6, 1977-1990, 2006. Krecl, P., Haley, C. S., Stegman, J., Brohede, S. M., Berthet, G.
Retrieving the vertical distribution of stratospheric OClO from Odin/OSIRIS limb-scattered sunlight measurements. Atmospheric Chemistry and Physics, 6, 1879-1894, 2006. Targino, Admir C., Noone, K.J., Oström, E.
Airborne in situ characterization of dry aerosol optical properties in a multisource influenced marine region. Tellus B, 57,247-260, 2005. Tjernström, M., Leck, C., Persson, P. O., Jensen, M. L., Oncley, S. P. Targino, A. C.
The Summertime Arctic Atmosphere: Meteorological Measurements during the Arctic Ocean Experiment 2001. Bulletin of the American Meteorological Societ, 85, 1305-1321, 2004. Experimental Equipment: A Supplement to The Summertime Arctic Atmosphere: Meteorological Measurements during the Arctic Ocean Experiment 2001. Bulletin of the American Meteorological Society, 85, ES14-ES18, 2004. Modeling surface energy fluxes for Iperó, SP, Brazil: An approach using numerical inversion. Atmospheric Research, 63, 101-121, 2002. Correlation Fields for Solar Radiation in Northeast Brazil. International Journal of Climatology, 21, 887-902, 2001. Radiación UV-B en superficie y contenido total de ozono en la Base Antártica Artigas Isla Rey Jorge-Uruguay. Instituto Antártico Uruguayo, Actividad Científica, 7, 111-116, 2000. Anomalías climáticas durante 1997 y 1998 en la Base Científica Antártica Artigas. Instituto Antártico Uruguayo, Actividad Científica, 7, 117-123, 2000.